Talk all you want to about the importance of strategy or operational efficiency, but the truth is that companies succeed because they offer a product or service that customers find irresistible. 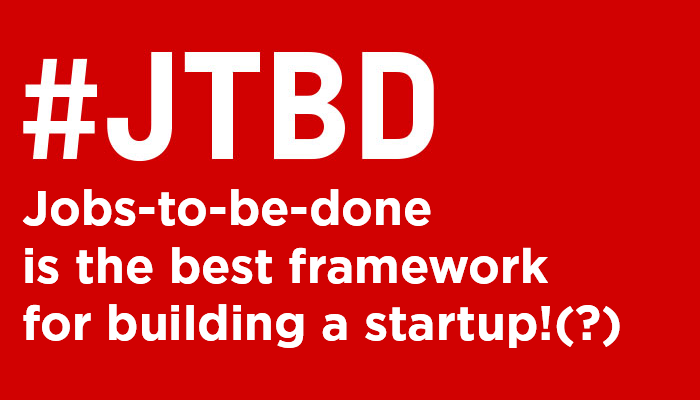 “Job-to-be-done” changed the way I am looking at the startup I am involved with. It forces you to look at other perspectives and for many people “jobs to be done” involves a mindset change. It forces you to look at our product the way customers do. Clayton Christensen described this concept in this paper he wrote with one of the best tech entrepreneurs and product marketers of all-time, Scott Cook of Intuit. Recently one of the pioneers of this concept, Bob Moesta, started a consultancy and great podcast around this concept. They even have a Twitter hashtag (#JTBD) about the topic. The theory simply asks, “What job your product is hired to do?”. For instance, most people would say they buy a lawnmower to “cut the grass,” and this is true. But if a lawnmower company examines the higher purpose of cutting the grass, say, “keep the grass low and beautiful at all times,” then it might forgo some efforts to make better lawnmowers in lieu of developing a genetically engineered grass seed that never needs to be cut. This is the power of the JTBD concept and technique: It helps the innovator understand that customers don’t buy products and services; they hire various solutions at various times to get a wide array of jobs done. You may need light survey design and sampling help from a statistician to apply this technique, but for the most part it requires no expert assistance, so you can try to use it right after you finish reading this article. You want to study customers and find out what they are trying to accomplish — especially under circumstances that leave them with insufficient solutions relative to available processes and technologies. What jobs have ad hoc solutions or no good solutions? When you see customers piecing together solutions themselves, these are great clues for innovation. Christensen would assert that people buy any product to get a job done. The best example he gives is describing market research he and his team did to understand fully why people bought milkshakes. This was after the milkshake selling company had carried out traditional market research and marketing with no success. Clay and his team found people were actually buying milkshakes because they were easy to drink in the car and helped break up the boredom of the morning commute. I won’t delve to deep into this case study if you want to read more look here. 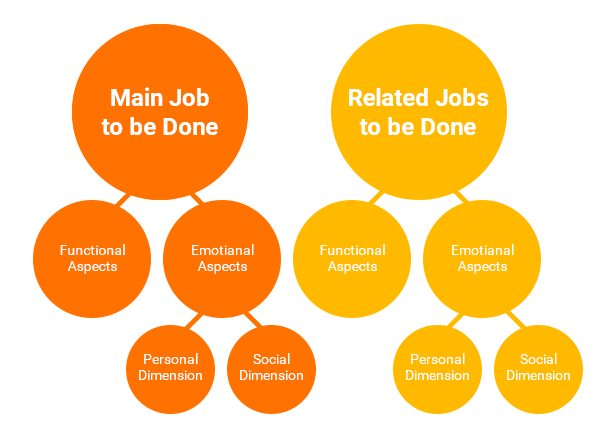 The “job” has a lot of “requirements” — not just functional but also emotional and social, which suggests that context and circumstances are important. 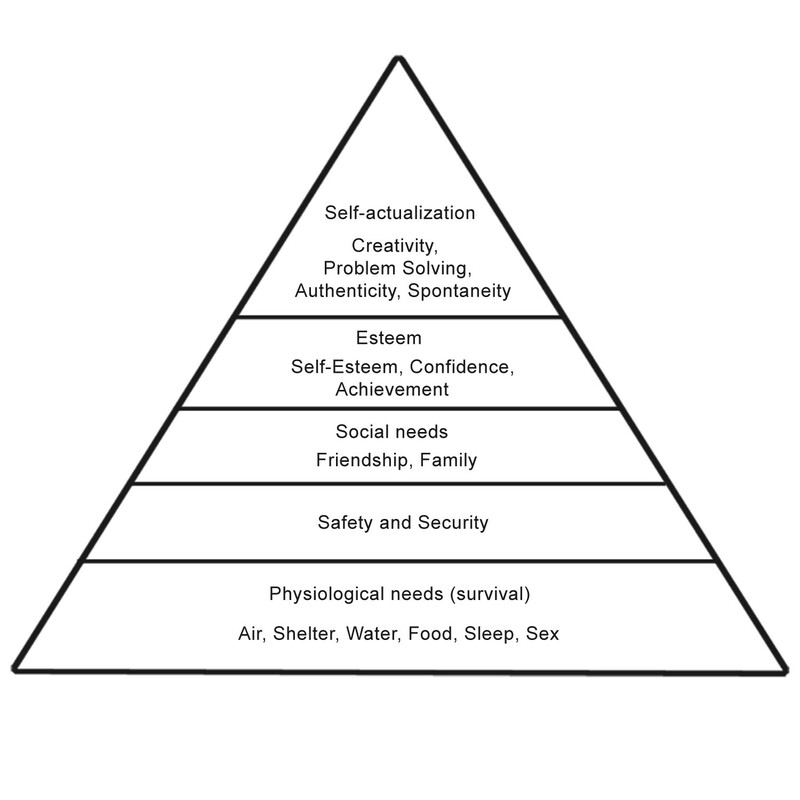 Functional job aspects — the practical and objective customer requirements. Emotional job aspects — the subjective customer requirements related to feelings and perception. Personal dimension — how the customer feels about the solution. Social dimension — how the customer believes he or she is perceived by others while using the solution. One JTBD is to organize and manage music for personal use. An important functional aspect of this job is to listen to the music. A related emotional/personal job is to organize and manage music in a way that feels good; a related emotional/social job is to share songs with friends. Related jobs might be to download songs from the Internet, make playlists, discard unwanted songs, and pass the time. If someone’s Job is to quickly satisfy their hunger on-the-go, they may consider a pizza…but also a sandwich, a burrito, sushi, Snickers, or even nothing — preferring to wait for another opportunity to eat. Knowing what products are in a customer’s consideration set for a Job, gives insight into what products a customer considers as competition for their Job to be done. That means that your product could compete with a bunch of different services from a different group of products. 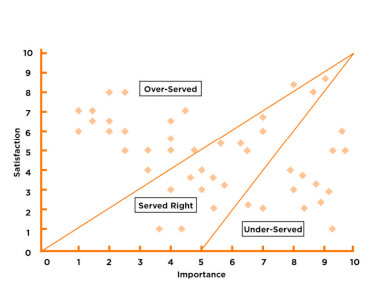 Source: “Giving Customers a Fair Hearing”, Anthony Ulwick; Lance Bettencourt, MIT SLOAN Management Review, Vol. 49, No. Key components of a job statement are an action verb, the object of the action, and clarification of the context in which the job is performed. There are hundreds of jobs that customers are trying to get done in every market. Which one of these offers the best opportunities for you? You might try to use Likert Scale & ask customers how important the job is, and how satisfied they are with an existing solution or service. A Likert Scale can also work for assessing the level of satisfaction customers have with current solutions. A core growth innovation strategy (make the existing solution better). A disruptive innovation strategy (remake the solution so it becomes available to those who can’t afford the existing solution). When your assessment shows opportunities in the middle that are served right, you should focus on related jobs to be done. You can tell when a company thinks in term s of JTBDs because the result not only fulfills a need, but is often quite innovative. Consider the recent developments in self-cleaning glass for cars and high-rise buildings, or in car paint that heals itself and, thereby, removes the need to paint over scratches. While you could think of painting scratches as a JTBD, it really isn’t. Painting scratches is actually a solution for accomplishing the JTBD called maintain a blemish-free vehicle. What criteria would the customer use to decide which solution to hire or use? Think in terms of time, cost, potential errors, quality, dependability, availability, ease of use, maintainability, and any number of other satisfaction and dissatisfaction dimensions. Outcome expectations are solution-neutral and reside at a higher level; they are JTBD-specific desires. Undesired outcomes providers want to avoid. For example, the job of safely transporting passengers from point A to point B has many associated outcome expectations, such as minimize the jerking motion a passenger feels while being transported, have a possibility to do his job while his traveling, and etc. It is important to ensure that jobs-to-be-done and desired-outcome statements use consistent, unambiguous language so as to be easily understood and readily translated into technical specifications. During data-gathering interactions, you can confirm desired-outcome statements with the customers themselves. After selecting the most relevant desired outcomes you can then conduct a quantitative survey to determine how important each desired outcome is and how satisfied customers are with their current product or service. If you remember anything about jobs to be done, remember this: they are completely neutral of the solutions you create (your products and services). While a customer JTBD remains fairly stable over time, your products and services should change at strategic intervals as you strive to provide everincreasing value.